Five months ago, when the members of ALA’s Privacy Subcommittee met to decide on this year’s “Choose Privacy Week” (CPW) theme, it’s a fair bet to say that only a tiny percentage of the general public had ever heard of Cambridge Analytica, Alexandr Kogan, the SCL Group, or of a fairly-obscure app called ‘thisisyourdigitallife’. In the library community especially, the right of library users to keep private their use of library resources has traditionally long been a hallmark of the ALA’s principles, embedded in its “Library Bill of Rights” and actively promoted by ALA’s Intellectual Freedom Committee and its Privacy Subcommittee. But those rights and protections are increasingly being challenged by the use of “big data”: library patron information that is bundled up, aggregated and usually (but not always) anonymized for varied purposes including trend analyses, grant funding, and reporting to local governments. Has this new era of data collection become another form of surveillance? Is the aggregated data of library users truly anonymous? Can we collect such data and still guarantee the minimum standards of privacy for our library users? We kicked off this year’s Choose Privacy Week on April 16 with a great webinar called “A Practical Guide to Privacy Audits”, presented by Erin Berman and Julie Oborny, both of San Jose Public Library. You can see the entire recorded webinar online here. 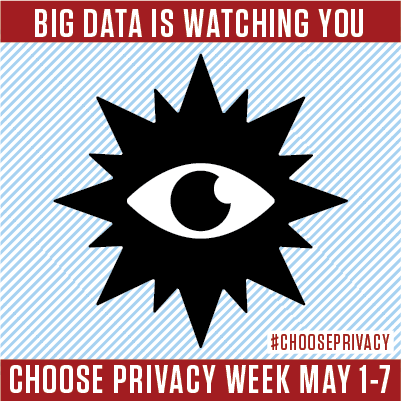 In addition, there are web and social media graphics and programming resources for libraries available through the Choose Privacy Week website to help librarians, library users, and community members engage in a conversation about “big data” in the library and its impact on individuals’ right to privacy. Monica Bulger, researcher at Data & Society, on student data and the impact on school librarians. Finally, the Choose Privacy Week website will soon be undergoing a name change. It order to emphasize the site’s year-round importance and its usefulness as a first-stop resource, we are changing the name to “Choose Privacy Every Day.” Not to worry, though, “Choose Privacy Week” will continue to live on as a featured segment, headlining the website the first week in May each and every year. What is your library doing for Choose Privacy Week?